Earlier this year, the ASPCA Humane Law Enforcement department received a tip that a New York City woman was living with a large number of dogs. When Agents arrived at the woman’s home, they found more than 50 Dachshund adults and puppies. It was clear the owner needed help, and that the ASPCA’s pioneering Cruelty Intervention Advocacy (CIA) program was best suited to assist. A team of five professionals that includes a social worker and case worker, CIA aims to stop cruelty before it starts. A large part of the team’s work is intervening in hoarding situations to assist both the animals and the people involved. CIA’s groundbreaking, holistic approach to these complex and sensitive cases both improves the welfare of animals affected and helps prevent hoarders from acquiring more animals. The client agreed to initially surrender 21 dogs. “Despite her desire to reduce the population, it's still very hard for her to part with the animals, and it's a slow process,” Cardona notes. All 55 dogs received spay/neuter services, wellness checks, vaccinations and other veterinary care as needed from an ASPCA Mobile Spay/Neuter Clinic, the ASPCA Animal Hospital and our partner veterinarians. Some of the adult dogs will receive ongoing behavioral treatment from ASPCA behaviorists. 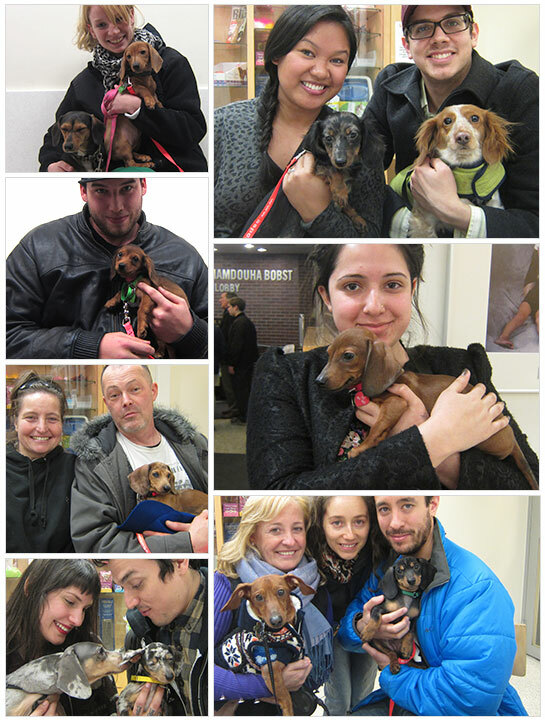 Fourteen of the Doxies surrendered were puppies who headed to the ASPCA Adoption Center to start their new lives. There, they were spayed and neutered, received treatment for infection, and soaked up lots of socialization. Soon after they became available for adoption, of course, the puppies were quickly snapped up by qualified families. In the coming weeks, the very grateful owner will surrender another wave of dogs, and the CIA program will continue to work with her to ensure the welfare of her animals. Stay tuned to the ASPCA blog for more information on this case, including photos of the puppies in their new homes. For now, we hope you enjoy these happy adoption pictures of some of the rescued puppies starting their new lives. We sure did! To learn more about the complex issue of hoarding, please visit our Hoarding FAQ. To see more adorable adoption photos, check out our special Facebook gallery.